A coding is a special tag that is pinned/unpinned (i.e. toggled on/off) by clicking its button. When unpinned (i.e. turned off), the coding’s button changes color, but remains visible. In contrast, with regular tags the button disappears when deactivated. Here, the first 4 buttons are codings the last green one is a regular tag. The coding outlined with a red box is ‘unpinned’. You can apply codings as quickly as tags. They’re in the tag pane, with one-click access. 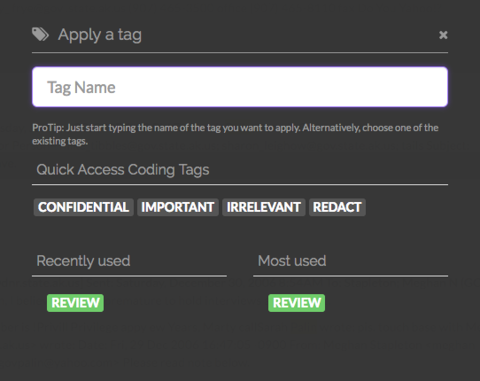 You can convert a tag into a coding, and a coding into a tag. In file listings, the coding tags appear before regular tags. 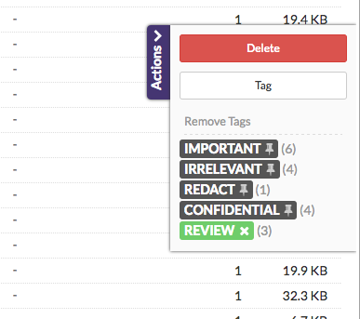 You can unpin codings and remove tags in bulk. If you delete a tag from the ‘Tags’ section, GoldFynch asks for confirmation and shows you how many files may be affected. We have also created ‘auto tags’. They are managed by GoldFynch, so you cannot add/remove/edit them. E.g. The ‘Untagged’ tag for items that don’t have any other tags.